A meteorologist at Vencore Weather, Paul Dorian, has stated that the sun has gone completely blank for the second time this month. He explained that this is a sign that the next solar minimum is approaching. This would mean an increasing number of spotless days over the next few years. 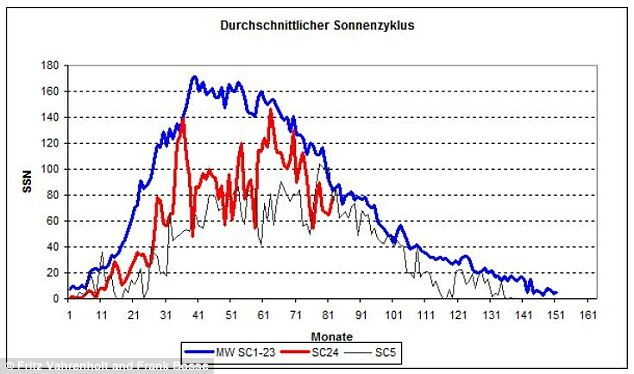 The lack of sunspot activity has spread fears that it will prompt the arrival of a very cold period on Earth like that of the Maunder Minimum, which started in 1645 and continued till about 1715. This period is known as the Little Ice Age. “At first, the blankness will stretch for just a few days at a time, then it’ll continue for weeks at a time, and finally it should last for months at a time when the sunspot cycle reaches its nadir,” Dorian said in a Vencore Weather statement. The current solar cycle is much lower than the one before it. Solar Cycles 23 (blue), 24 (red), 5 (grey). This fits with predictions by Dr David Evans with the Notch Delay theory and with the double dynamo work of Shepard, Zharkov and Zharkova. Evans found that the flickering changes in total solar light (TSI) lead temperatures on Earth with a delay of a half solar cycle (roughly 11 years). He found a major error in the current climate models which completely ignore a whole class of feedbacks. A model with the correct architecture shows the role of CO2 is a mere tenth of that predicted and when the notch and delay effect is included a solar driven climate model predicts cooling in the near future, most likely from 2017. The solar mechanism probably works through cloud cover due to some combination of solar wind, magnetic effects or spectral cycles (changing UV). Changes in direct sunlight are not responsible themselves, just a leading indicator. Shepard, Zharkov and Zharkova posit that the sun operates as two separate dynamos on slightly different cycles, and predict that we are headed in the 2030′s for a point where the two dynamos are operating out of synch, effectively cancelling each other out. UPDATE: And if you did think the world was more likely to cool rather than warm, you might want to know about Cool Futures: the plan to set up the Worlds first hedge fund that aims to pop the climate-bubble. Evans, David (2015) The Notch Delay Solar Theory, ScienceSpeak. Scafetta, N.: Multi-scale harmonic model for solar and climate cyclical variation throughout the Holocene based on Jupiter–Saturn tidal frequencies plus the 11-year solar dynamo cycle. Journal of Atmospheric and Solar-Terrestrial Physics 80, 296–311 (2012).